The key to manage your funds successfully is to understand the banking activities and how they really affect your account balance. Almost every individual holds a bank account nowadays, and banks process millions of transactions each day that has made the banking system even more complex. There are a number of banking activities posted each day, including credit entries, debit entries, or bank transfers, and it is very important to know how a particular bank activity will affect your balance. The credit entries include the check or cash deposits, and online bank transfers from another bank account to your account, whereas, debit entries include fund withdrawals, transferring out money from your bank account to another bank account, online purchases or bill payments, etc. These transaction entries appear in the form of balances on your bank statements. Two of these balances are available balance and posted balance. If you are not familiar with the banking activities, you may end up confusing these terms, and may take decisions that would negatively affect your financial goals. Although, it seems like both available balance and posted balance are same, but in fact, they are not. So what is an Available Balance and Posted Balance, and how are they different from each other? To answer this question, it is essential to take an understanding of what posted balance is, and then learn about the available balance. This balance is calculated by subtracting the “holds” with the today’s and future date from the “posted balance”. A “hold” is the amount that a bank doesn’t allow to be used by the customer. It usually arises from direct deposits, debit card purchases, notice of returns, check deposits that are yet to be cleared, and notice of collection. “Hold” is for a temporary period of about 1 to 14 days, and once the reason to hold that money is resolved, it usually forms part of the posted transaction. Available balance is the amount of balance that is available to be used by an individual at any time, and is usually represented by a difference between a ledger balance and any unprocessed transaction. The difference between these balances can be well understood with the help of an example. Let’s say, a person has an opening balance of $200 in his bank account, and have $20 check deposit waiting to be clear (on hold). After he makes some online purchases of $40, the posted balance will be $160 ($200 – $40) and his available balance will be $140 ($200 – $40 – $20). 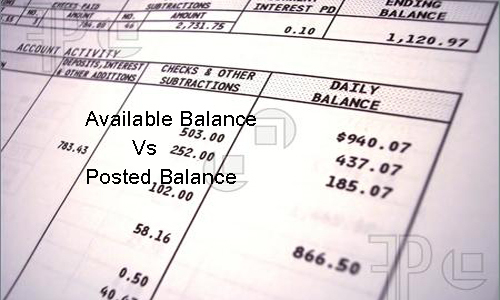 Therefore, you can see that unlike available balance, posted balance doesn’t take into account the on-hold amount. When you use your debit card to purchase groceries, or other household items, a bank place a hold on the amount the merchant requests authorization for, because the transaction is still pending on the bank’s side, and is not received from the merchant. This “hold” impact the available balance, which is why the posted balance is mostly higher than the available balance. It is necessary for every individual to understand the differences between the bank balances these days, because misinterpreting these balances can affect their financial decisions. For example, when a person performs bank reconciliation, he may end up taking posted balance as available balance, due to which the balance on the bank statement will not match the balance calculated by him. As a result, his financial performance will get affected by this, if he has taken all of his financial decisions on the basis of his personally calculated balance. Hira Waqar. "Difference between Available Balance and Posted Balance." DifferenceBetween.net. September 27, 2017 < http://www.differencebetween.net/business/difference-between-available-balance-and-posted-balance/ >.